With the vast amounts of information and data available today, there is a constant stream of research conducted on almost any topic. Websites and blogs are regularly updated with competitive analysis, market research, and the results of scientific inquiry and academic study. But where do you go to find trend analysis and research summed up in one place, in a format that can be re-purposed and shared? Increasingly, thought leaders are using SlideShare as their destination for publishing research in the form of presentations. Viewers are hungry for well-informed trend analysis such as Internet Trends Report presented by Mary Meeker of Kleiner Perkins Caufield Byers at the D: All Things Digital conference in New York City. It’s clear from the number of views this presentation has received that the business community wants reports which share statistics, examples, trends and concerns about today’s business climate. Businesses of any size can view, share and download information that until recently was only available to those who could afford the reports. In the new world of business, forward-thinking companies recognize that there is great value in sharing information. Rogers Communications is a Canadian provider of wireless, cable TV, home phone, Internet, media and sports properties. Rogers recently commissioned a study on how connected Canadians are using the Internet now and how they want to use it in the future. Rogers published the complete study results on SlideShare. Altimeter Group is a research-based advisory firm whose business model includes sharing their research and analysis with the business community. Although the consultants at Altimeter publish information on the firm’s website and the consultants’ individual blogs, the central location for their reports is their SlideShare network. Trendwatching delivers trends, insights and related hands-on innovations to over 160,000 business professionals in more than 180 countries. Each month Trendwatching shares its latest findings in a free Trend Briefing. The slide deck is uploaded to SlideShare, with links to more detail on the Trendwatching.com website. 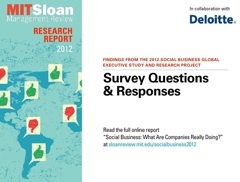 MIT Sloan Management Review recently shared its survey questions and responses from the 2012 Social Business Global Executive Study and Research Project, conducted with Deloitte. Researchers surveyed more than 3,400 corporate leaders and conducted a series of in-depth interviews with experts and corporate practitioners to discover how social networking is transforming business. The slide deck includes the detailed questions and responses. And on the opening slide there’s a link to the in-depth report on the MIT.edu website. Michael Habib is a product manager and librarian who is passionate about creating intuitive user experiences that connect people with the information and experts they need. Michael shared his recent research in the presentation New Technologies: Empowering the Research community for Better Outcomes, examining digital trends and their effect on streamlining scholarly literature research. The Pew Internet & American Life Project aims to be an authoritative source on the evolution of the internet through surveys that examine how Americans use the internet and how their activities affect their lives. The project generously shares its research which spans from the shift of Americans’ reading habits to a study on how young adults get news and information about their local communities. More and more thought leaders are posting their analysis of trends as presentations on SlideShare. Even if the primary function of your company is not research, you can increase your reach and influence by sharing knowledge with presentations. Posting research on SlideShare increases the credibility of your company or organization and strengthens your brand. Research and analysis that is published on SlideShare creates an easily findable archive, a body of knowledge. Expand your network by following presenters who are uploading and sharing content that interests you. When searching and browsing through SlideShare presentations, be sure to ‘favorite’ those that you want to return to. New uploads from people you follow will appear in your SlideShare newsfeed. Are you using presentations to communicate and distribute research? Let us know in a comment below.